China's trade with the US declined by 10.1 percent and the trade surplus widened in January, as uncertainties about the China-US trade relationship weighed on shipments. But domestic analysts said that with policy support and a gradual rebound in confidence, the situation might improve in the second quarter. According to figures announced by the General Administration of Customs on Thursday, China's January trade surplus with the US widened by 31.2 percent to 188.4 billion yuan ($27.8 billion), and overall trade with the US dropped 10.1 percent to 315.8 billion yuan. China's imports from the US edged down by 38.6 percent year-on-year to 63.7 billion yuan in January, compared with a 2.3 percent decline in December. In terms of exports, China sold 252.1 billion yuan worth of goods to the US in January, up by 1.9 percent year-on-year, but slowing from the 8.6 percent growth seen in the previous month. Overall, China's imports were up 2.9 percent year-on-year in January to 1.23 trillion yuan, while exports rose 13.9 percent to 1.5 trillion yuan, the figures showed. 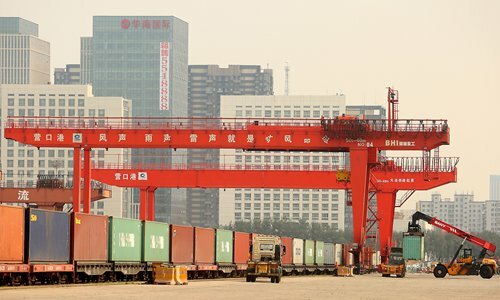 The figures for the US not only show that the uncertainty of the China-US trade situation is forcing the market to take risk aversion measures - they also reflect that China's dependence on US trade is sliding, Bai Ming, deputy director of the Ministry of Commerce's International Market Research Institute, told the Global Times. According to Bai, the China-US trade cooperation framework has not been irreparably damaged so far. "But if there's no solution to the two countries' trade row in the near future, there's a possibility that the China-US trade platform and industrial chain could be harmed, which will hurt the bilateral trade relationship to a greater extent than at present," he said. A report the financial research center under Bank of Communications sent to the Global Times on Thursday noted that the trade dispute between China and the US seems to be in a "truce" phase because of the round of trade talks that are going on between China and the US. But it will take time for trade companies to restore their confidence about China-US trade. According to the report, company confidence about China-US trade might start to rebound gradually in March, and export growth might edge up accordingly in the second quarter this year. Foreign direct investment (FDI) from the US to China increased by 124.6 percent year-on-year in January. The growth exceeded those from other main sources of overseas investment - Singapore (5 percent), the UK (13.7 percent), and the Netherlands (95.6 percent), data from the Ministry of Commerce (MOFCOM) showed on Thursday. "The surge of US direct investment in China is inseparable from China's efforts to improve the business environment in recent years, in particular since last year," MOFCOM spokesperson Gao Feng told a regular briefing on Thursday. "We'll continue to make efforts in this regard to improve the business climate for different kinds of companies," Gao added during the press conference on Thursday. China's actual use of FDI was 84.18 billion yuan in January, up 4.8 percent on a yearly basis, according to the ministry.